President Trump is already tapping his wide-ranging powers on U.S. trade policy. But you may be surprised by just how much Trump can do without any approval from Congress. One of his first executive orders on Monday was to withdraw from the Trans-Pacific Partnership (TPP). Earlier in the morning, Trump met with CEOs and reiterated his threat to use a "border tax" against companies that move jobs outside the U.S. Slapping tariffs -- or taxes -- targeted at specific companies would be very hard to do under current law. But Trump has significant authority to unilaterally hit any country with a tariff. He doesn't need a green light from Congress, according to the Peterson Institute of International Economics. "A president who wants to restrict trade enjoys almost carte blanche authority," says Gary Clyde Hufbauer, a trade expert at Peterson. Here are three of the ways Trump can go after other countries on his own. Trump could invoke the "Trading with the Enemy Act of 1917" to hit a nation with tariffs as high as he wants. Under the law, the president can restrict all types of trade "during time of war." That definition is very loose though. America doesn't have to be at war with a particular nation -- it just has to be "at war" somewhere in the world in order to apply tariffs against other countries. Experts believe U.S. special forces in Syria and Libya would suffice to meet that requirement for Trump to hit countries such as China and Mexico with tariffs. In 1971, President Richard Nixon used this act to impose a 10% import tariff (not directed at any particular nation) citing the Korean War, which had ended nearly two decades prior. Technically, America was still in a state of emergency which had not lifted. All to say: the excuse of war has a very loose interpretation that the President can use. If that law sounds too outdated for Trump to use, there's another -- the International Emergency Economic Powers Act of 1977. It gives the president authority to use tariffs on another country during a "national emergency." Again, defining an emergency is vague. Losing manufacturing jobs to Mexico and China would suffice as one. Also, courts have never rejected a president's reasoning. The big difference between this Act and the one from 1917 is that Trump can't seize assets using this one. But that's not his aim anyway. This law has been invoked against Nicaragua, Panama, Sierra Leone and Somalia. It was used "in circumstances that few observers would characterize as an unusual or extraordinary threat," says Hufbauer. Trump can also rely on the Trade Act of 1974, Section 122. It gives him authority to impose across-the-board tariffs. Trump just needs to find "an adverse impact on national security from imports." Lost jobs could qualify. The caveat: There is a cap on the tariffs of 15% and it's only good for 150 days. Then Congress needs to approve it. So, it's a blunt rule that could have a severe short term impact but it expires after five months, unless it is extended by Congress. Trump can also use the Trade Expansion Act of 1962. Ronald Reagan used this one. It allows Trump to slap targeted tariffs on certain industries, like steel. It's not as broad, but Trump can raise tariffs as high as he wants on specific things. Trump would undoubtedly face resistance within his administration, from members of Congress, U.S. companies and countries. But time is on his side. Court appeals would take months, even years, to work their way through. In short order, if he wants, Trump can impose tariffs as high as 35% on Mexico and 45% on China as he has threatened in the past. But he would need to withdraw from NAFTA before he could slap stiff tariffs on Mexico. 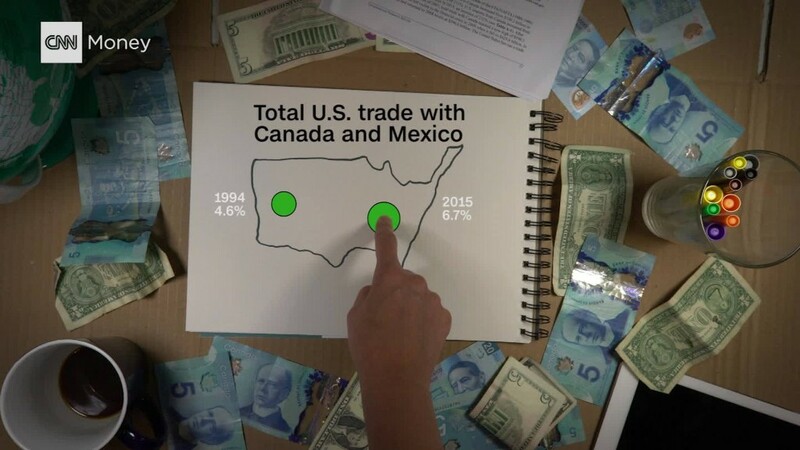 However, if Trump hits these countries with tariffs, trade experts say Mexico and China will almost certainly retaliate with tariffs against U.S. products. That defines a trade war, which can hurt both countries and its citizens in unforeseen ways.